This workshop is designed to introduce students to the historical process of the building of America from the time of the first trains to the end of the 19th century. Starting in 1829 with the first train built in Baltimore students will learn about the power of steam. They will be shown models of stationary steam engines and move into demonstrations of the transfer of steam technology to locomotion. Preliminary to the workshop, each school will be sent a packet of material for the teachers to use as foundation material for target studies. Included are essays on Coal, its nature, mining, and utility, on Wood and Lumber, its great variety, harvesting and uses, and Machinery and Manufacturing. An essay on 'how steam locomotives really work' and an essay on 'Railroad Lanterns and Signalling' will be mandatory reading for the entire class, and a document of validation of that fact must be signed by each teacher before the presenter may come to the school. Depending on the demographics of each school, classes will be arranged as 'work gangs' assigned to running a railroad. In order to acquire and lay down each piece of track for a 20 by 12 foot layout, the gang must collectively answer forty questions posed to them by the Train manager, teacher or proctor at each station. There is enough track and as many trains and cars to operate five independent gangs and systems. The gangs will be posed questions from their studies and be asked to solve problems about fuel and water consumption. They will be asked to make judgments about physical problems and they will be challenged with geographic and physical problems, all requiring teamwork resolution. Each gang will have a 'signalman' responsible for the 'signal lamp' and its operation. Each lamp is an authentic antique of considerable weight and value, and must be handled with care and respect. A test run of all the signal lamps will require each team to have learned the meaning of the master control signals, and using the signal chart, interpret signal messages from the master light tower. The successful operation of each gang's rail system hinges on getting the signals correct. They must all know the signals for Stop, Go, Proceed with Caution, Wait, Reverse, Free Run, Slow, Switch track, and Enter System. Once all the independent gangs are operational, each gang will be responsible for expanding their 'line' by merging with another system and building a large track layout around the entire gym or utility room floor. When completed each gang will make a contribution of cars to the large train and help get it running. Again, signals and signal monitoring are vital. A separate project, which may be included as a separate, single day activity, is the construction of a large model steam locomotive. 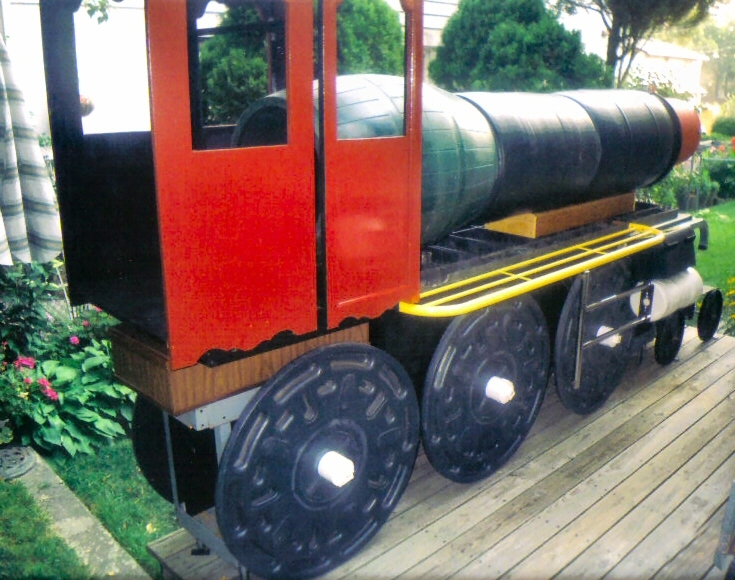 The train is brought to the school site in pieces and measures 18 feet long, by 3 feet wide, by 7 feet high when fully assembled. This train incorporates all the essential components of a working steam engine and will be assembled on site by use of task booklet guides. Reading the booklet and following its step by step instructions will get the train built in approximately one hour. It must also be disassembled by reverse engineering, again following the task booklet instructions.